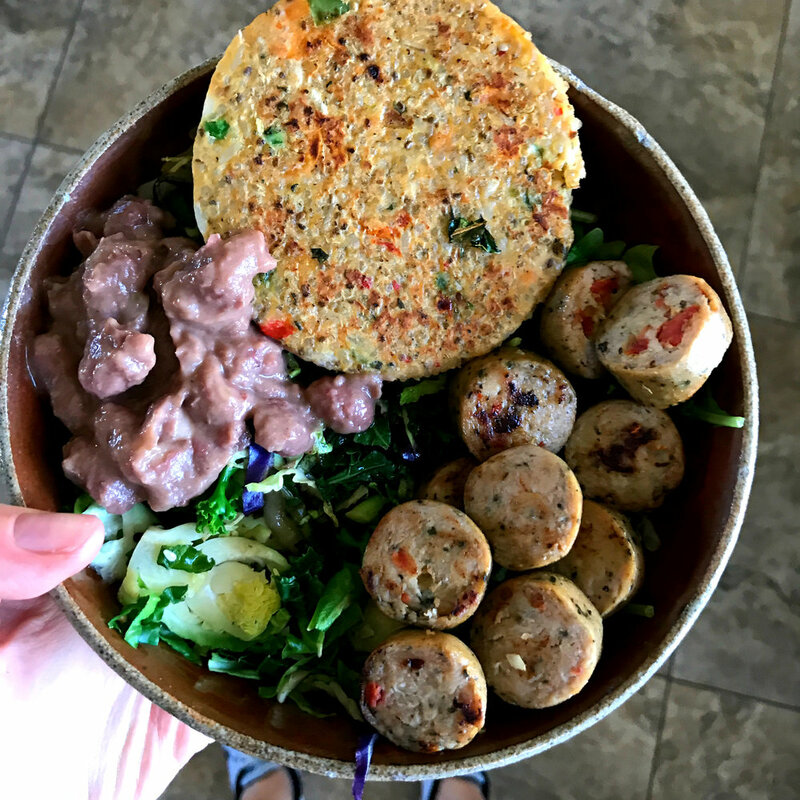 My go-to lunches these days are a giant nourish bowl. I wouldn't call them salads because a) when I think of salads I think of feeling hungry after finishing them, and b) these bowls are so much more than a plain ole' salad! I do usually start with either arugula or spinach at the bottom (usually a big handful), but then I load up ALL the goods (hence the "nourish" bowl name) that I have in my fridge. Some thing I always push with my clients is eating balanced meals. By this I mean making sure you have vegetables, healthy fats, good carbs, and protein with every meal. I mentally go through that checklist with every breakfast, lunch, and dinner that I make. If you're missing one of them, ADD IT IN! I go through this list with my bowls, and top the arugula or spinach with what I have available. I love roasting a bunch of veggies every few days because it's such an easy, and tasty, way to up my vegetable intake (my recipe is HERE). I usually add some leftover roasted veggies to the bowl (sweet potato, brussel sprouts, and broccoli are my favourites! ), and I'll maybe even cut up some bell peppers or cucumbers if I'm feeling fancy. Next, I add some protein. I usually add chicken, chicken sausage, or tuna because they're quick and easy! Then I'll add a healthy fat which is usually avocado, olive oil (drizzled over the bowl) or seeds. To add some good flava to the bowl, I'll sprinkle Trader Joes Everything but the Bagel Seasoning on top. I also drizzle my cheesy tahini sauce dressing over everything, and add some hummus, Better Beans, or Kite Hill chive cream cheese to the side for some dipping action! IT'S SO EASY TO PUT TOGETHER AND SO SATISFYING!! 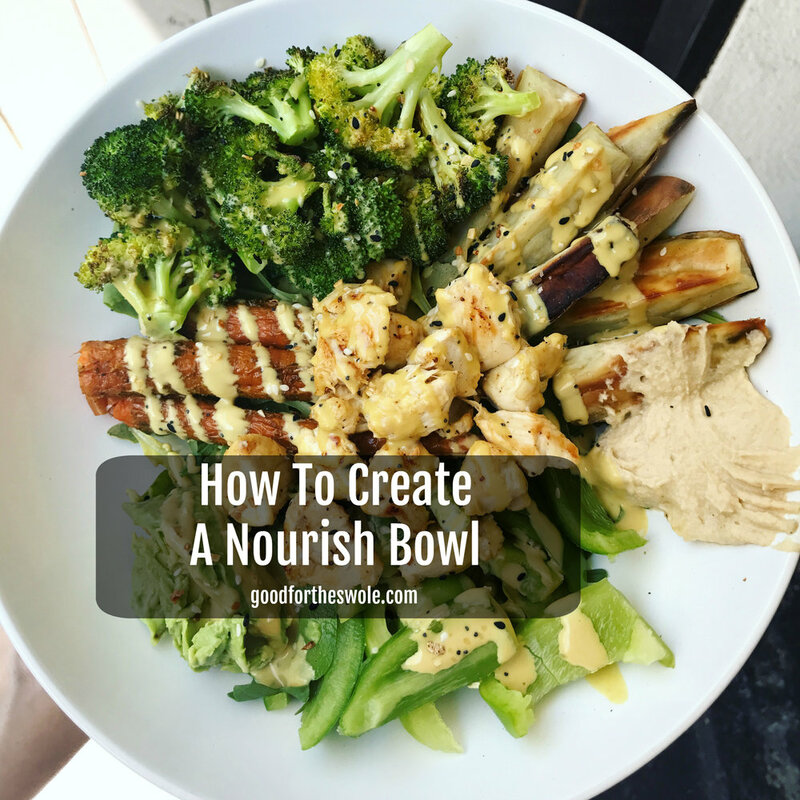 I hope this helps give you some ideas of how you can make your own nourish bowls with what you have in the fridge!! Happy Wednesday!